You may have noticed concussions being discussed more frequently on the news recently, particularly when related to professional athletes. What may be a surprise you is how common concussions actually are among non-athletes and that they are not always connected to a sports injury. In this article, we will take a closer look at what is referred to in the medical community as mild traumatic brain injury (MTBI). There were 2.5 million emergency room visits for brain injuries in 2010, according to the CDC, and that only represents the number of people who chose to go to a hospital. Many times people don’t think they have a concussion unless they’ve lost consciousness. 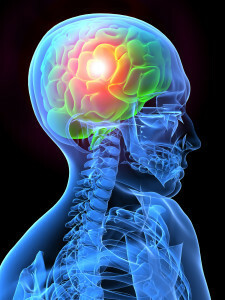 However, even low-speed impacts to the head can cause a concussion, and the person does not have to lose consciousness. Concussions are a widespread problem among all ages, not young adults. In 2009, approximately a quarter of a million minors were cared for in emergency rooms for brain injuries. Older adults can get concussion too, typically from falling or a car accident. A 5-year study reported that more than 40% of brain injuries were caused by falls. That makes up more than 80% of concussions in seniors and more than half of concussions in children age 14 and younger. A few other common causes were unintentional blunt force trauma (accidentally getting hit by something), car accidents, and assaults. Most patients affected by an assault were between ages 15 and 44. Research has shown that concussions can be accompanied by long-term effects such as headaches or migraines, vertigo, cognitive difficulties, depression and anxiety, insomnia, and other symptoms. All of these symptoms can be caused by not only an injury to the brain but also a misalignment of the atlas vertebra, the top vertebra of the neck. A shift of alignment is common anytime excessive force affects one’s head. A misalignment to the atlas can put pressure on the brainstem, cause restricted blood flow to the brain, and cause issues with cerebrospinal fluid drainage. Because of this, concussion symptoms may remain and become chronic, a situation called post-concussion syndrome. For many patients, correcting the misalignment has led to fewer symptoms or even a full resolution of their post-concussion syndrome. To hear more about this wonderful treatment method, schedule a consultation. Upper cervical chiropractic care could provide the relief that you’ve been looking for.